Hardangerfjord sightseeing, daily 1.5.18-30.9.18. Fjord cruise, round trips to Norheimsund, Herand, Utne, Lofthus, Kinsarvik, Ulvik and Eidfjord. 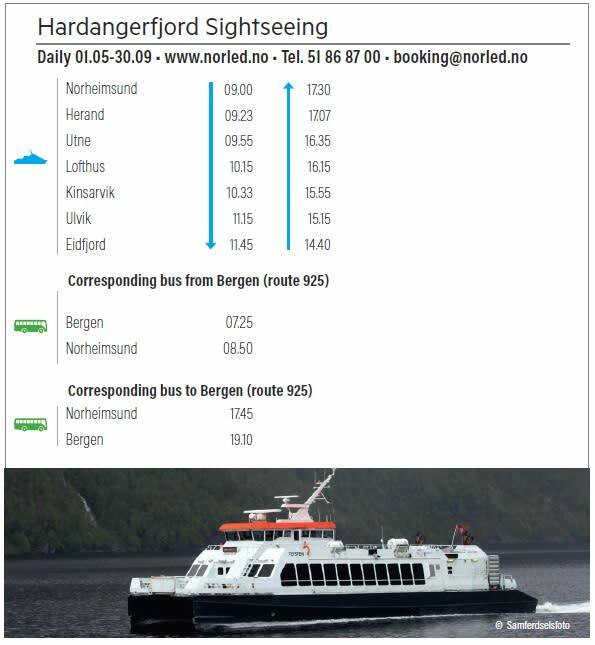 Corresponds with bus service to and from Bergen. "Hardangerfjord in a nutshell", "Hardangerfjorden in a nutshell winter" and "Hardangerfjorden in a nutshell & Rosendal" are ready-made roundtrips starting in Oslo or Bergen including the Hardangerfjord region. All travel by train, bus and passenger ferries, and includes a sightseeing trip to the famous Vøringsfossen and Hardangervidda Nature Centre Eidfjord. When ordering you are free to include overnight stops and activities along the route. More information about "Hardangerfjord in a nutshell", start the tour from Bergen or Oslo. More information about "Hardangerfjord in a nutshell & Rosendal", start the tour from Bergen or Oslo. 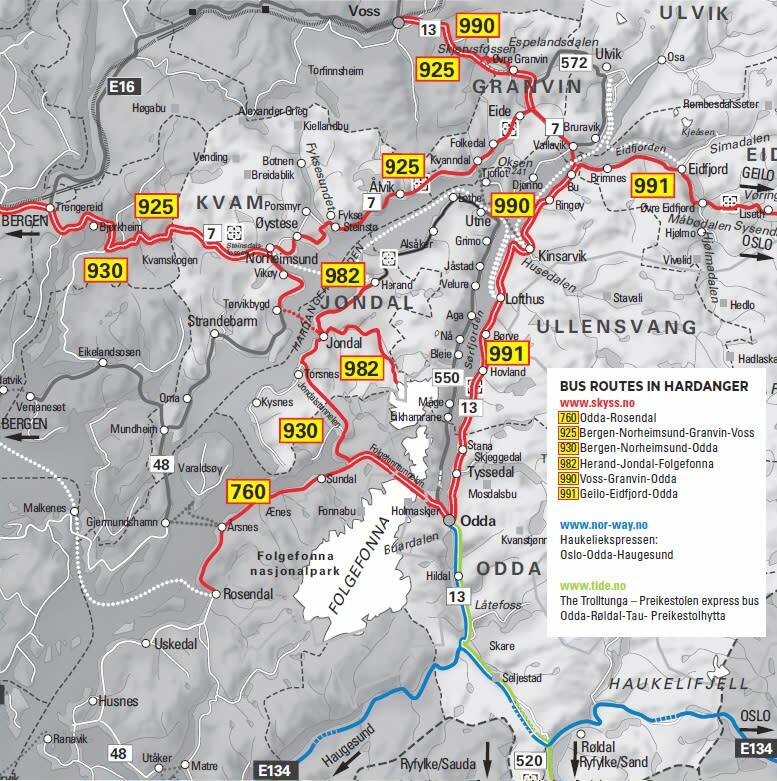 Shuttlebuss between Odda, Tyssedal P1 and Skjeggedal P2 is operated by two companies - ODDATAXI (OT) oddataxi.no and TAXI/BUS ODDA (TBO) taxibusodda.com. Season 1. June -30. September. Price (return ticket) Odda - Skjeggedal P2 NOK 250.